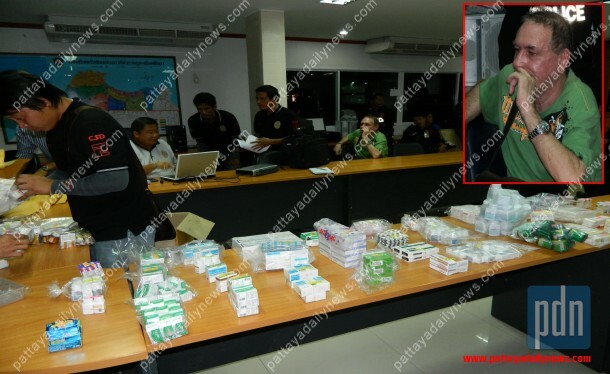 The Pattaya Police Crime Suppression Division arrested a British citizen for his involvement in an online website selling anabolic steroids and sexual enhancement drugs at Buy-Steroids-Direct-Asia.com. Neil Patterson-Hartley was arrested in Thailand on November 3, 2011 after a lengthy investigation into the website. Pattaya Police decided to arrest him after they failed to capture his boss a month earlier. The police investigation originally targeted Chris Ireland (also known as “Daff”), the alleged owner of Buy-Steroids-Direct-Asia.com. A Pattaya provincial court granted police a search warrant to raid a condominium owned by Ireland on October 8, 2011. Ireland eluded police and was thought to have left Thailand. It is believed that Ireland resides in Ukraine. While Ireland escaped, police were able to seize over $300,000 of various oral and injectable anabolic steroids and sexual enhancement drugs stored in the condominium office. Computers and customer databases were also seized from two additional properties raided by police. A preliminary review of the revenue and expense reports indicate the Buy-Steroids-Direct-Asia.com operation allegedly sold close to $100,000 in steroids and other drugs each month. The business had been in operation for approximately three years. The seized records identified the majority of the customers as living in the United States and England. Patterson-Hartley, who worked for and was directed by Ireland, was charged with possession of conventional medicines for sale without a license, and the illegal possession of psychotropic substances.